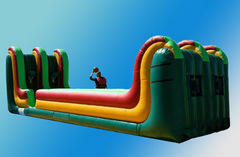 Our classic bungee basketball run inflatable game is still one of our most popular inflatable rentals. Two people race each other with bungee's attached. See how far you can run before the bungee pulls you backward. How many baskets can you make... with a bungee cable strapped to your back? Bungee Basketball is a game that participants of all ages will love. This can be played as a bungee run also, where the players see how far they can place the velcro been bag.